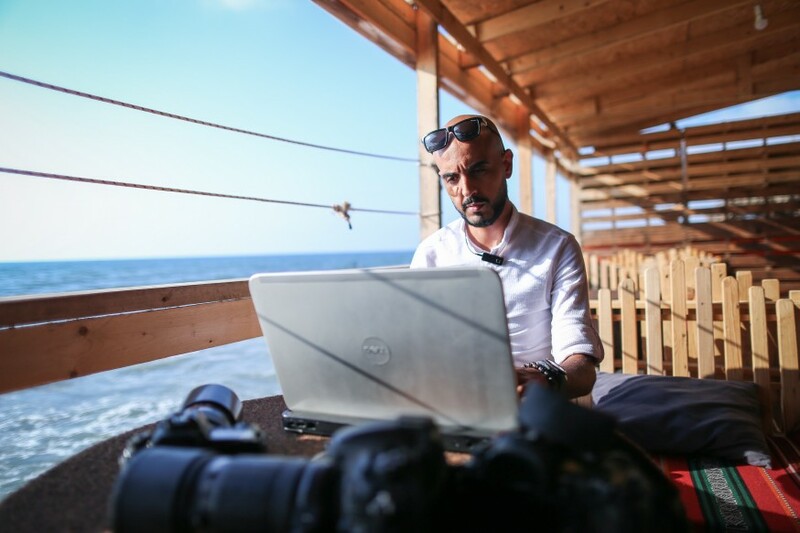 Mohammed Al-Zaanoun, Gaza-based photojournalist. Covering events in Gaza since 2006. On a Friday [during the Great Return March], my friend urged me to leave. He said, “Aren’t you sick of taking photos? Enough, we’re exposed, leave this place.” I kept telling him to wait — there was a photo I felt the need to take. He stepped in, took my hand, and pulled me out of there despite my protests. While we were walking away, an explosion happened in the place I was just standing in. Sixty people were injured. My friend panicked and told me he had a feeling something would happen to me if I stood there. That was a terrifying moment for us all. Fares Marwan Al-Ghoul, 27, Executive Director of Mayadeen Media Group (Satellite Broadcasting Service). Covered assaults on Gaza in 2012 and 2014 and the Great Return March. On May 14th and 15th during the Great Return March, my father, brother, and I were providing satellite broadcasting services for CBS. My father was working in Northern Gaza, my brother, Oday, was in Eastern Gaza, and I was in Khan Younis. We separated to cover different parts of the protest. Those two days were the most dangerous for us. So many people were killed by Israeli snipers. We had no signal and could not communicate with each other or check in on one another except through other satellite broadcasts. My brother was working with Al-Jazeera so I kept that broadcast on. I would take the frequency he used and put it on my side screen so that I could see him, hear him, and know that he was safe and well. At the end of the day, my father and the CBS crew came to the protest location that I was working at. God, it was such a relief to see him coming towards me. I cannot deny it; I was truly terrified to lose someone or to have my loved ones lose me. I know that Israel’s military targets journalists. 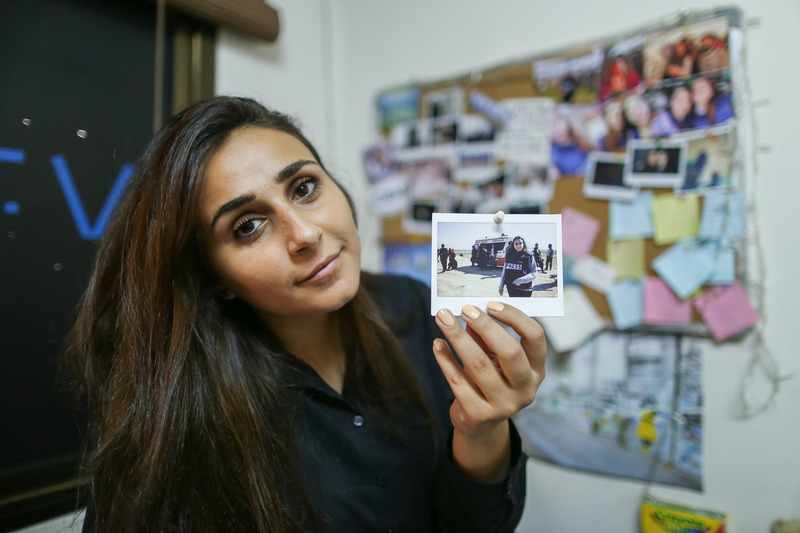 Hind Al-Khoudary, 23, freelance journalist. Covered the Great Return March. Hind is suffering from the side effects of excessive exposure to tear gas. At the Great Return March, people were shot in front of my eyes. They lost arms and legs. I saw children crying. So many things I never imagined. What I witnessed there was worse than anything I’d ever seen and it’s very hard to cope. Before we [journalists] would head to the protests, we were afraid. I thought about how terrifying it would be to get shot or lose a limb. But when you're in the field, you feel a sense of bravery. You don't feel anything, even when you're faced with sniper fire and tear gas. You suddenly feel strong enough to cope with everything that's around you. The courage catches you by surprise, but then you go back home and the fear sneaks into your heart again. 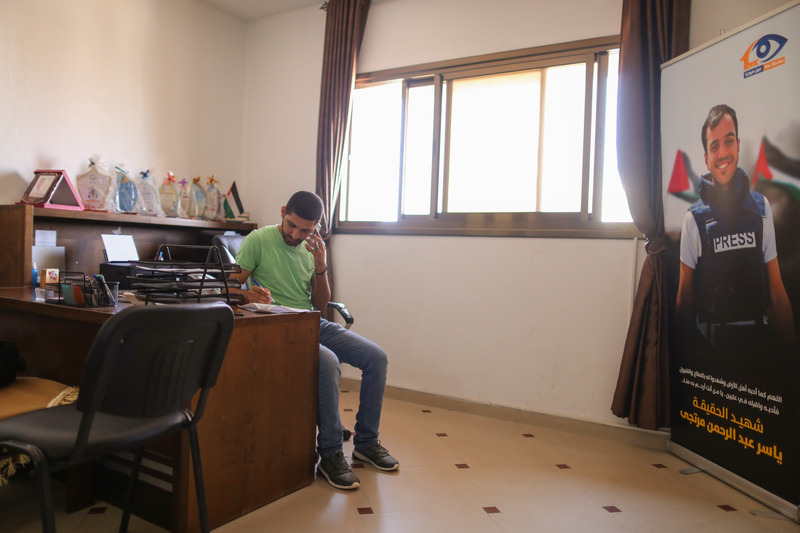 Rushdi Al-Sarraj, 26, Co-Founder of Ain Media Production Company with journalist Yassir Murtaja, who was killed by an Israeli sniper during the Great Return March. Covering events in Gaza since 2012. I was filming just a few meters away from Yassir when they shot him. The moment I heard what happened, I threw everything I had in my hand — cameras and equipment — and hurried to the ambulance. I saw him on the stretcher. It was one of the hardest moments of my life. I stayed by his side for twelve hours and held onto hope, waiting for him to wake up in the ICU. We were with him when he lost consciousness. We talked to him and tried to give him the power he needed to hold onto his life and to us. But the bullet, fired by an Israeli sniper, was stronger than all of us. They took his life. Yassir dreamed of making films, but he’d never get to go into the field again. It was the toughest day of my life, a turning point. I lost my best friend and work partner. Yassir and I built our hopes and dreams together. We had plans for our company and dreamt up what it would look like — how we would make it big, produce our films, and participate in international festivals. In his absence, I feel all of our dreams will vanish. We were like an airplane with two wings. Yassir kept things together. We lost the most passionate, creative professional in our field. 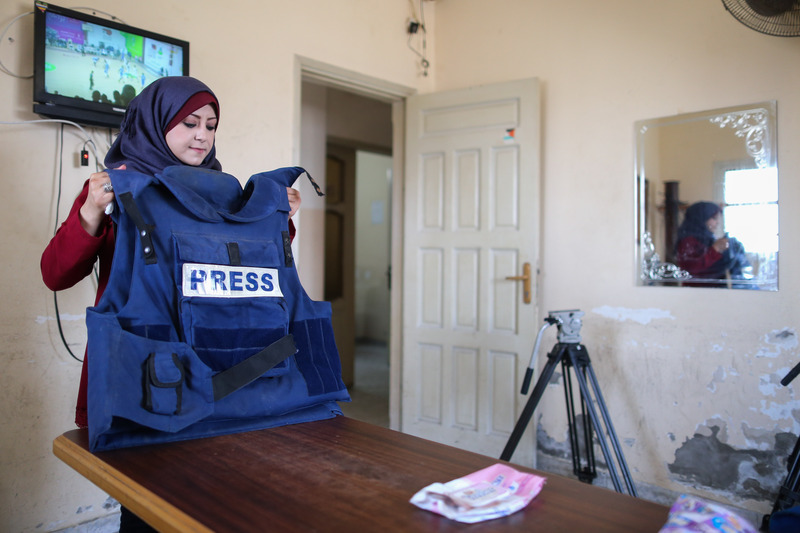 Safa Al-Habeel, Correspondent at Palestine TV & DW Network. One time, I had to go off air and cut my TV report short because of how badly I was suffocating from tear gas. My mother and siblings were following my coverage and couldn't figure out what happened to me until I managed to call them. My mother was anxiously begging me to come home. I understand their fear, but at the end of the day, this is my job and I must get it done. Covering the Great Return March is one of the toughest jobs for journalists. The gravity of the atmosphere, the lack of equipment, and lack of a means of protection has every one of us feeling like a dynamo. We run back and forth between protests. It's tough knowing that we're becoming more and more of a target for Israeli snipers. 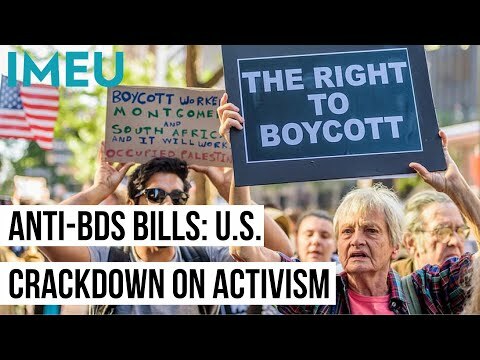 Not only do we have to deal with Israel’s military occupation and human rights violations, we have to fear for our lives. All photos by Moataz Alaraaj.